I just received the newest release, Reconsider Me, and I really like it! Opening with Fenton Robinson's You Don't Know What Love Is, Myles shows that he has a terrific voice for soul and guitar riffs to match. Joined by Derrick 'D'Mar Martin on drums, Endre Tarczy on bass and keys, Kid Andersen on rhythm guitar and keys, Nate Ginsberg on piano and keys and Lisa Andersen on backing vocals this track is hot! My definite favorite on the release. Rory Gallagher's Do You Read Me is really hot with a funky flavor and Gallagher's intent blended with SVR's flair. This is a really interesting track an one that will likely appeal to a broad audience. One of my favorite old Elvin Bishop tracks, Rock My Soul, is up next and even though it wasn't a Mickey Thomas era track, Myles vocals have a Thomas timbre. A fun track and a feel good track. Breaking into a full rock track, Myles breaks loose with cool rock riffs and Anderson's backing vocals really add a nice touch. Very nice! Title track, Johnny Adams' Reconsider Me, has a real nice sway and a definite gospel feel reinforced by organ filler and finite piano riffs. Myles further shows his vocal range with near falsetto high notes. His guitar soloing on this track is clean and interesting. Sweet! Roman Carter's Queen Bee has that rolling James Brown R&B feel with Myles taking total command with his strong vocal and nicely appointed guitar details. 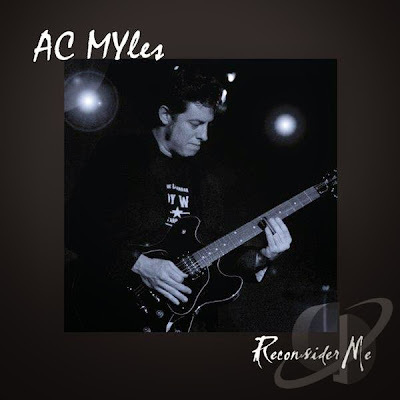 Myles takes the lead on guitar and shows how nicely a man can lead and follow his own voice. Very nice job! Livin' A Lie shows Myles ability on slide guitar with bad intention. A stylized rock track, this track is really the closest thing to a pop track on the release. With extensive flaming slide work on this track, it's a sure winner. Death Bed Blues is the first down the middle blues track on the release. With a standard 12 bar blues with vocal call and guitar response this track is rock solid. Bart Davenport track, What Is Love, is a simple ballad with a taste of country. Myles uses this simple platform to again show his versatility and nicely executed. Call 'em All Baby comes out of the gate hot with a Lynyrd Skynyrd like swagger. A catchy melody and perfect execution make this the sure fire winner for radio play. Boogie track Three Ways To Fall again finds Myles grabbing the slide and he does a real nice job on this track. His vocal styling and simple sliding technique make for a track that most blues rockers will love. Wrapping the release is Fats Domino's Blue Monday, and man does it get a make over. Myles has done a really sweet job of interpretation and I really like the way his voice sounds on this track. Kind of a mix between Thomas and John Fogherty. This funky rocker is definitely one of the best tracks on the release and a super closer for this very cool release. Looking forward to getting it into my car for further review!